A piping and instrumentation diagram (P&ID) is a graphic representation of a process system that includes the piping, vessels, control valves, instrumentation, and other process components and equipment in the system. The P&ID is the primary schematic drawing used for laying out a process control system’s installation. As such, the P&ID is crucial in all stages of process system development and operation. P&IDs also are used as the basis for the live graphic representation of a process system in its HMI (human-machine interface) or other control system. There are standard symbols used to represent the components in these diagrams. It is important to note that these symbols are NOT to scale and are NOT dimensionally accurate. They are merely used to represent a certain type of component. These symbols are also labeled with words, letters, and numbers to further identify and specify the components that they are representing. Another important consideration is that the diagrams do NOT always represent the physical locations and proximity of each component. The purpose is NOT to serve as a floor plan or map of the system, it is to illustrate the process of the system. The generic symbol for a 2-way valve is two triangles pointing to each other with the tips of the inner points touching. The pipe lines are represented by lines connecting to each side of the valve symbol. Various types of lines are used to represent different pipes, tubes, and hoses. These examples use single solid lines which represent simple rigid pipes or tubing. Typically all pipes will run either vertically or horizontally and use only right angles. The direction of flow is indicated by an arrowhead at the end of the line where it meets the next component as well as at every 90 degree turn. The type of valve is represented by adding a shape to the center where the points touch. Shown here are P&ID symbols for the most common valve types. All of the valves represented above are 2-way inline valves that are used for flow control, either on/off or throttling. For Multi-port valves, such as 3-way and 4-way, the structure of the symbol is similar, having a triangle to represent each port or “way”. 3-way and 4-way ball valves can contain additional detail that defines the type of ball drilling which is either a “T” or “L” port ball. Another detail that may be represented in the diagram is the flow path in the non-actuated or de-energized state. This is shown using small arrows next to the symbol as shown below. There are a multitude of other valve types as well. Here are some of them. The method of actuation is defined by a line coming up from the center of the valve with a small symbol, many times containing a letter, at the top of the line. Here are some examples of ball valves with different methods of actuation. When the actuator has a fail-safe position, it is represented by an arrow on the line between the valve and actuator. Another method used to represent the fail position is with two letters “FO” or “FC”. End connections can be represented generically with the lines representing the pipes going directly into the valve as in all of the examples above. Connections may also be explicitly defined using various other methods. Flanged connections are represented as shown below – where the pipes have perpendicular lines at their ends that run parallel to the sides of the valve symbol with a small space between them. This illustrates that the valve can be removed without cutting the pipe. Semi-permanent threaded connections are shown with small hollow circles at the connection point. Permanent welded connections are represented with small squares instead. If the connection is socket weld, the square is hollow or un-filled. The International Society of Automation (ISA: www.isa.org) has defined a standard for P&IDs. The standard is ANSI/ISA-5.1-2009 and is available on the ISA website. Despite the fact that there is a strict set of standards defined for these symbols, you will find various ways of representing certain valves. You will also find that there are blatant discrepancies between some valve types across various libraries, industries, and companies. This issue is not that problematic since all components are also described by text, a part number (unique model), a tag number (specific component in the system), and are defined in detail in a key or legend that goes along with the drawing. As long as you remain consistent throughout your drawings, the P&ID diagram will be acceptable and understandable by all who work with it. We recommend that you download our Library of Symbols and import it into your diagram software package such as Lucidchart. The process lines are the lines where the process media actually flows through. They are represented by different types of lines. On a complete P&ID each line will be labeled wit h a line number. For Example: 150-67P00-2299-115101-N. This label will either run parallel with the line, or with a callout line pointing to the line being defined if it does not fit on the line itself. The label will include information about the size, class, insulation, and more. Different companies use different structures for these numbers, but they all contain the same information. Process lines are bolder than other lines such as those that represent electric, pneumatic, or data signals. There are 2 methods to illustrate when pipes cross on drawings but are NOT physically connected. Either use a small “hump” to show one going “over” the other, or break one of the lines very near the other to show it going under it. This is NOT a physical representation of the actual pipes. In fact, they may not even cross in the actual system. It is merely a method to keep the lines separate when they must cross in the drawing. Process control systems use various types of signals to communicate information between components, instruments, and the control system computers. Each type of signal has its own line type to explicitly identify the type of signal that travels along it. The list goes on and on… There are literally hundreds of symbols that represent all components used in process control systems. Heat exchangers, coolers, boilers, filters, etc.etc. 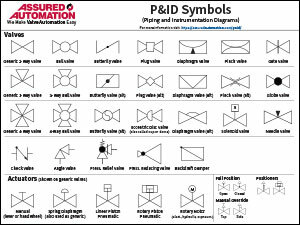 We have created a library of P&ID symbols that includes the most common components used in piping and instrumentation diagrams. Instrumentation refers to devices that sense, measure, indicate, transmit, and/or record physical properties within a system. For these types of components, there is a slightly different approach. The components are represented by what is called a “bubble.” The bubble is a simple circle, square, or hexagonal shape. Square bubbles represent shared display. A shared device either displays information from multiple instruments, controls multiple instruments, or both. Inside the square will be either a circle or a diamond. Hexagonal bubbles represent computer systems. Circular bubbles represent discrete instruments. This type of bubble is also used to define the function of final control elements such as valves. This is done with a callout line pointing to the symbol for the control element. The letters and numbers inside the bubble are described below. All of these bubble types are further defined by a horizontal line, lines, or lack there of. These lines define where the instrument is located and whether or not it is accessible to the operator. No Line means that the device and/or its display are physically located in the field and if it has a display it is only readable locally. A Solid Line means that the display is located on a main control panel or video display and is normally accessible to the operator. A Dashed Line means that the display is NOT normally accessible to the operator. A Double Dashed Line means that the display is located in a secondary control panel and is NOT normally accessible to the operator. Inside of the shape there are letters and numbers used to designate the property being measured (such as flow rate, pressure, temperature, or level) and the function performed with that measurement. Typical functions are: display, record, transmit, and control. Below are a few samples, along with a chart of letters and what they represent for the most common instrumentation components. This is followed by loop number, which is unique to that loop. For instance FIC045 means it is the Flow Indicating Controller in control loop 045. This is also known as the “tag” identifier of the field device, which is normally given to the location and function of the instrument. The same loop may have FT045 – which is the Flow Transmitter in the same loop. Below are some examples of complete symbols for a few instruments in the same loop. There are several different software packages that are available for creating P&IDs. We use and recommend Lucidchart by Lucid Software Inc. The library of P&ID symbols that we have put together is very easy to import into this package. This entry was posted in Latest News and tagged 2 way valve symbol, 3 way valve symbol, downloadable pdf P&ID symbols, valve diagram, valve P&id. Bookmark the permalink.